Around Day 100, effectiveness dropped 4%. Around another Day 170, effectiveness dropped another 5-10%. But for the benefit of science, Gus has risked his own lungs by continuing the test for another 60 days. Gus turns on the Original DIY while he sleeps each night and tracks effectiveness using a Dylos particle counter. 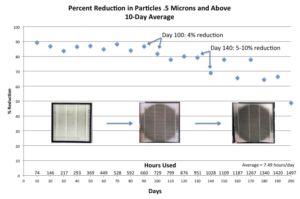 I calculate effectiveness as the percentage decrease in the number of particles .5 microns (and above) over the course of the night. The death crawl continues. At Day 200, effectiveness dipped to just below 50%. At the risk of Gus’s health (especially given the coming onslaught of winter air), I voted for Gus to stop the test. So the test is over! 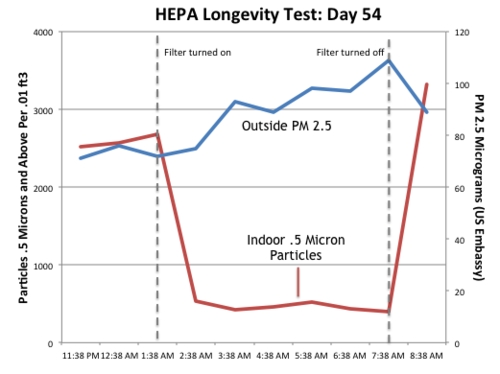 In real Beijing air, the Smart Air HEPA lasted at 100 days at about 8 hours a day at full effectiveness (729 hours to be exact). It lasted through 140 days (1,028 hours) with a slight 4% drop, which is when I would change the filter. Limitations: We did the test in Beijing, so HEPAs probably last a few more weeks in places with cleaner air (but still not “clean air”) like Guangzhou and Hong Kong. As always, I’m publishing the raw data–all 200 days!